The fall and the dark season are on the horizon; but not at Malagacar.com! Here our cars wait for you in the sun, ready to take you for a ride along the Costa del Sol. And we are not getting tired of creating new promotions for you, both returners, as those of you who rent for the first time a car at Malaga Airport with us. Because we love to do things right and your satisfaction is also ours. Since Halloween enjoys a great popularity in some English speaking countries, our next promotion of 15% discount shares the same name. Fortunately, the discount is valid not only for a terrifying night on the Costa del Sol. You can enjoy this special price for bookings on some of our models in October and November. 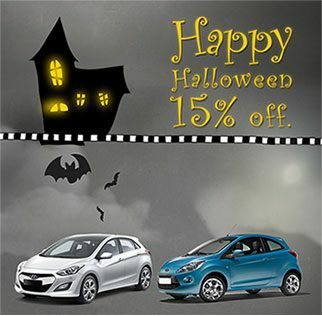 You only have to enter the page of Malagacar.com and book your car with the code Halloween! If you wish to be updated with such offers, you can also sign up for our Newsletter and we will keep you informed on the latest promotions by email. We have as well an older Post entry where you can find plenty of useful information on how to obtain your Promo Code at Malagacar.com Discount Vouchers. How to get your Promo Code. Seize the opportunity and escape from fall to the Costa del Sol to enjoy long walks on empty beaches, go hiking in the interior of the province, open the golf season and discover the cultural side of Malaga city or the charming White Villages.